Hello there! My name is Chris, from Abbotsford, BC. Just picked up this 1980 CB400T HAWK from a friend of mine who rode it for a season or two. 10,000 miles on the clock and in very clean condition. Ive applied for collector status plates and got denied due to missing the "hawk" decals. I will be having some make that match the colour combo of the pin striping and will hopefully be in action come a week from now. This bike will serve as my Saturday coffee getter and Sunday ice cream ride with the lady. Ive only taken this thing around the block so far and have noticed it does not ride anything like my most recent bike (obviously). anyone have any suggestions on how to freshen up the steering and suspension. I presume the fork oil has never been changed. Im open to the idea of a steering damper and fork brace if anyone has any good reviews on any. I wouldnt mind running a fork brace and a light bar since I imagine the light output isnt the best on this bike. Ive also got a front end and rear end from a 2011CBR125R kicking around. Toying with the idea of putting the clipons, front bakes, and rear sets on this bike as well. any modifications that would need to be made wont be too much of a problem as I am a machinist by trade. Ive also got a small leak to deal with in the carbs and a completely rounded over oil filter bolt. Last edited by c_ouellet; 04-15-2019 at 10:15 AM. Thanks for the link! I had spent a day looking for something like that. However, the price to get those stickers to my door is almost 1/5th of what I paid for the bike! So I may just stick with the company that will print me them for $5 each locally. Sounds like a deal,I'm very lucky to have a sign shop 6 blocks from my house,I give them a sample and they reproduce it. 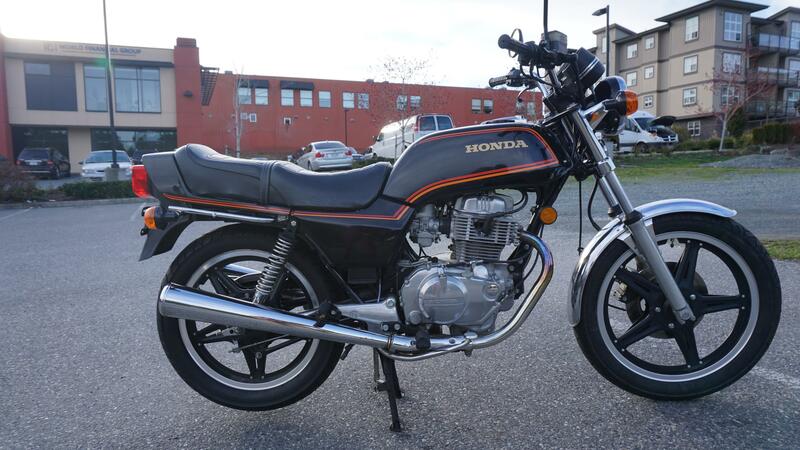 Your bike is the nicest 1980 CB400T Ive seen great score! Oh jeez, my bad, it was 155WHP. Good eye. Ill see if I can change that. Welcome to the forum. Great to see another 400 series here. Great looking bike. Welcome!. That is a good looking ride! If your going to use is for Sat coffee and Sun ice cream runs with the lady you may want to leave it stock. Its pretty comfortable as is. Can't see where rear sets would improve that. Anyway, you'll need a proper Factory Service Manual in your endeavors. PM sent. You're most likely right that it will be by far more comfortable if left stock. However I cant help but want to tinker with it just a bit. Nothing permanent because I always want the ability to return it all back to stock. This here is what Im hoping to attain. 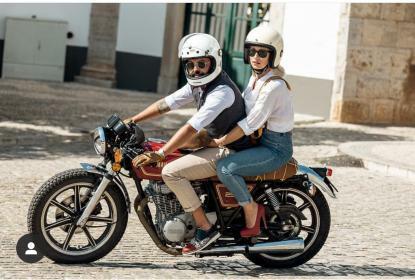 I rode in the distinguished gentlemans ride a few years back and have regretted selling my old CB250RS ever since. 1980 CB400T Hawk ignition switch - will it fit on my 78 CB400T II? 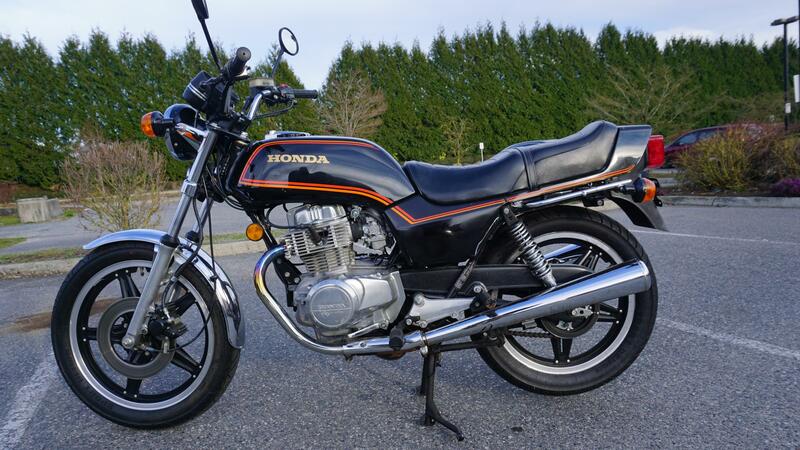 1980 CB400T Hawk - Kicker? Is it the right price?